Our Head Groomer Nadine is fully qualified and completely passionate about what she does. From leaving school Nadine went straight into Animal Care, Management and Dog Grooming courses along the way working and volunteering in rescue establishments and dog grooming parlours. Friendly and confident she puts every effort into making sure every dog looks their very best. 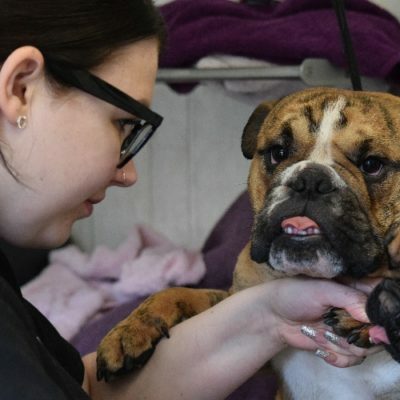 Nadine’s inspired to make sure dogs are not just at the groomers, but treated at the Spa receiving a luxury pampering. She makes sure each and every dog is taken care of to the highest standard receiving top treatment to leave them looking and feeling great. Nadine’s enthusiasm for dogs is a noticeable trait, the proud owner of six dogs, Nadine’s life genuinely revolves around the love she has for them. 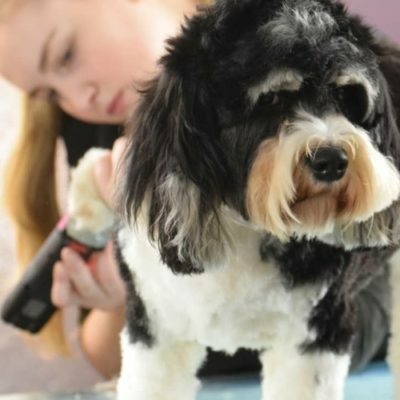 Our junior stylist Rose joined the Dogaholic team in February 2018. Rose came to Dogaholic after completing a Level 3 Extended Diploma in Animal Management including psychology and training modules. A keen animal lover from a young age, Rose rescued a Bully cross when she was 18, named Duke and now shares her home with Duke and her French Bulldog, Beau.